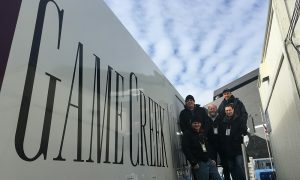 Game Creek Video trucks and staff were out in full force all week in Minneapolis, serving NFL Network, ESPN, and Kraft Productions during the lead-up to Super Bowl LII, as well as onsite studio programming on game day. For NFL Network, Game Creek had Encore working its Pre-Game Show at U.S. Bank Stadium on Sunday, Pride for Super Bowl Opening Night at the Xcel Energy Center on Monday and the NFL Honors and red carpet on Saturday, and Apollo at the Minneapolis Hilton to cover Commissioner Roger Goodell’s annual press conference and other pressers. In addition, Game Creek’s Liberty was on hand at the IDS Center supporting ESPN’s Super Bowl Week set, and Gemini was at the Mall of America serving Kraft Productions and the Patriots’ “Not Done Yet Network” throughout the week. While Game Creek is no stranger to providing a parade of trucks for a single event, the scattered nature of this year’s Super Bowl events made it more challenging, with events taking place at the stadium, Mall of America, Nicollet Mall, the IDS Center, the Convention Center, the Xcel Energy Center, Northrop Auditorium, the Hilton, and other locations.